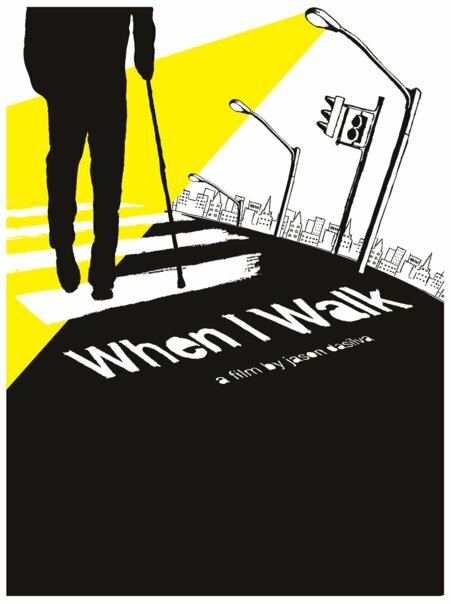 “I may be walking slower; but inside I’m racing.” The words of Jason DaSilva in his new film, When I Walk. In 2006, at the age of 25, Jason collapsed on a beach on holiday and couldn’t get up. He was diagnosed with Multiple Sclerosis and documented his life for the next 6 years on camera. The result: a raw, vulnerable and powerful autobiographical film. As filmgoers, we connect with and reflect on what we know. Having a mother who lives every day with this terrible disease, I obviously have a stronger bond with this film than most. But When I Walk speaks volumes to any audience member. It is beautiful in its sincerity and is a story in which anyone can lose themselves. In the wake of its recent UK premiere, I caught up with Jason over Skype from his place in New York. After its super-positive reception at Sundance in 2013, this UK showing was way past due. Lovely Edinburgh was its host city, and the event, coinciding with MS Awareness Week, took place at the Filmhouse and was organised by a small charity called the MS Therapy Centre Lothian, based in Edinburgh. It is part of a network of centres across the UK, which support people living with MS and provide a range of therapies to help them self-manage their condition. Jason has Primary Progressive MS, named so because the symptoms get worse right from the onset. His hands are curling up, he’s in a wheelchair and his vision is worsening at an alarming rate. At the beginning of the film, after just 6 months of his fall on the beach, his walking ability has noticeably decreased – “I just started using a cane and already they’re talking about wheelchairs,” he comments. Yet throughout the film his humor and good spirit are as evident as they are during the interview. He has a relaxed coolness about him and a matter-of-factness about his condition. “The good thing [about making the film] is you can edit out the problems so I can look at least semi-graceful”. Many of us, if presented with similar troubles might see them as setbacks. But not Jason. He certainly threw himself into the filmmaking process, with an impressive array of filmmaking techniques expertly blended together. From traditional documentary to animation to selfie shots to almost guerilla-filmmaking type shots, all combined with inventive use of sound design and music. He also did the artwork! However this type of filmmaking presented a new challenge for him – making himself the subject. However Jason is not the sole subject of this documentary. His wife, Alice, whom he meets during it, becomes an integral part of Jason’s life and the film, offering a new lease of life to both. She appears not only as a subject but also as a camera operator and co-editor, becoming Jason’s hands in the editing suite when he can no longer use a mouse and keyboard. We eventually get a happy ending – they now have a son. When I Walk can be a tough emotional ride, but there are also so many upbeat and heartwarming moments. The emblematic JUST MARRIED sign pinned to the back of Jason’s scooter as they ride the streets of New York as a newly married couple is one such moment. Yet it recalls another challenge Jason faces – getting around, especially in NYC. In his words, there are no accessible cabs, the subways are difficult with a lack of elevators, pedestrians are rude and cars knock you down. Educating the general public about wheelchair and walker users is of paramount importance and is obviously a true passion of Jason’s. AXS Map, featured in the film, is an app powered by Google Maps which crowdsources information from users to ascertain the accessibility of shops, restaurants, cinemas…you name it. 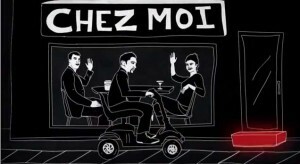 A wonderful idea that hopes to make it easier for the disabled among us to get around. However, when I ask if the taxi situation has improved at all since the film, he laughs. That’s a NO. There is the tiniest lapse in his normally calm exterior when I ask him about how he handles feelings of resentment. “I think it’s like, and I’m sure everyone [who has it] can relate to this – it’s like an ongoing thing. There’s no solution to it. So it’s just like an ongoing battle that I think everybody faces themselves. And those who say that MS is a gift and all that – I don’t think it’s a gift – they’re kinda just saying that to make light of it. But I don’t think that it’s like that, because it’s really difficult sometimes. The whole film is life-affirming and makes you want to live life to the full. But perhaps more importantly, it lifts the veil on a terrible disease, previously underrepresented in the media, relative to its incidence. What’s more, a well-received film, with a subject matter that affects a significant number of people in the UK, required a small, local charity in Edinburgh to take the reigns in organising its UK Premiere. This is a film that deserves much more attention than it’s had this side of the pond. And it should be seen the world-over. WHEN I WALK will air on PBS in the US on 23 June, with plans for digital distribution via Netflix and iTunes in the near future. At present, there are no further plans for UK distribution. However, Tugg events are still rolling, so why not organise an event at your local cinema? One comment for "When I Walk – A Battle With Multiple Sclerosis"